Largo di Torre Argentina is my favorite "little known" place in Rome. 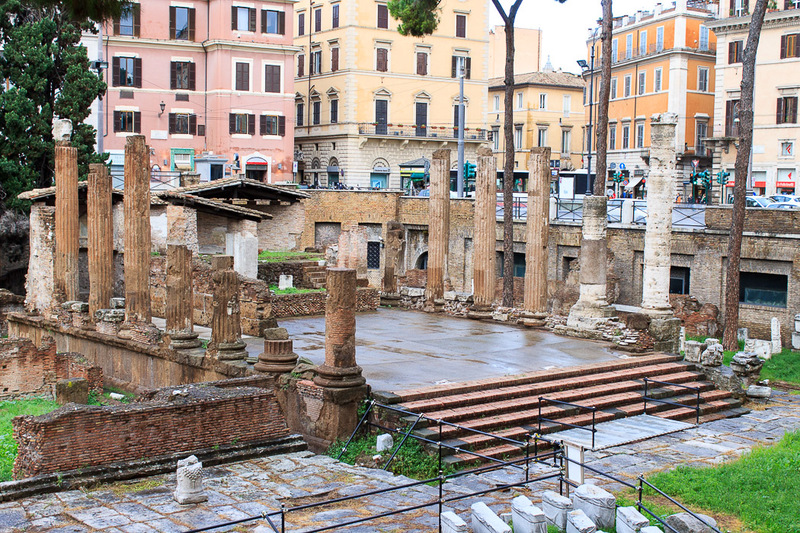 Located 4 blocks south from the Pantheon, it's a city block that's been excavated about 12 or 15 feet down, and found to contain 4 republican-era temples, two of which are comparable to the temples in the Roman Forum, the other two of which require quite a bit of imagination. You can walk around the city block on normal city sidewalks, and look into the excavated area which contains the temples. Surrounding you will be buses, since this is a place where many buses stop, and tram 8 which runs south into Trastever from here. 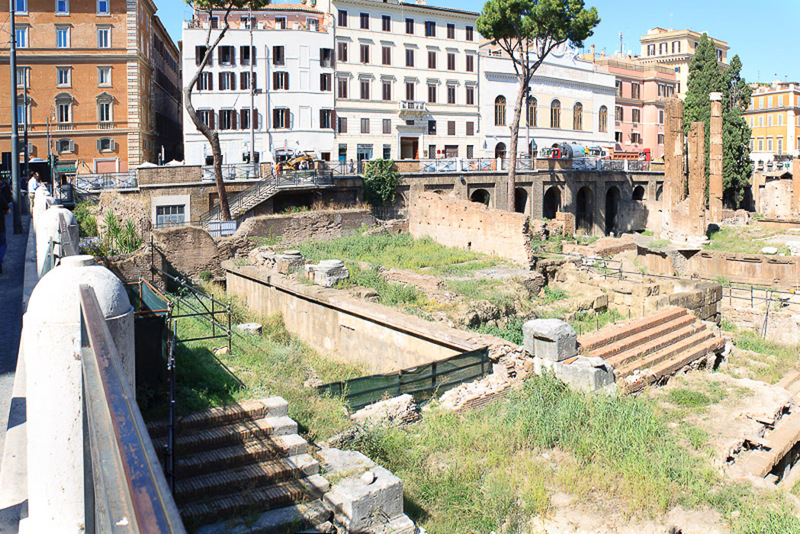 As a bonus for the imagination, the Largo di Torre Argentina probably contains the spot where Julius Caesar was assassinated. The four temples are cleverly labelled as Temple A, B, C and D, from right to left, when being looked at from the front (that is, on Via di San Nicola di Cesarini) (that's the viewpoint for both of the photos below). The easiest way to identify the 4 temples is to look for the entry stairways at the front of each temple. 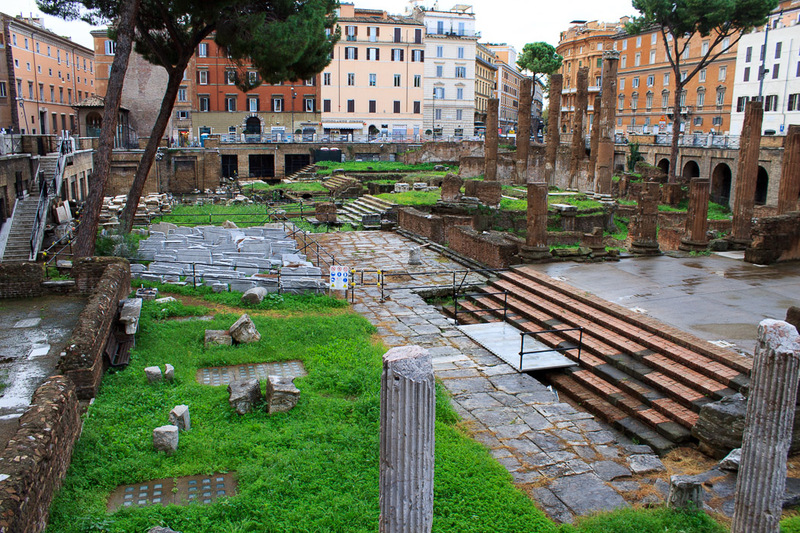 See all Largo di Torre Argentina photos. Temple A (photo below) is probably the Temple of Juturna (the goddess of fountains, wells and springs), built by Gaius Lutatius Catulus after his victory in the First Punic War against the Carthaginians in 241 BC. The temple was rebuilt twice due to rising ground level due to floods. The second rebuilding, in the first century BC, is the temple we see today. It is rectangular in shape on a raised platform, and is bounded by 7 columns on each side, most of which are standing. Originally the temple had 9 columns down the sides and 6 columns across the front and back, and they were completely coated with white stucco to make them look like marble. Repairs following the great fire of 80 AD include the two travertine columns in the front of the right side of the temple. The church of San Nicola dei Cesarini was built into the temple in 1132 AD, and at the back of the temple you can see two apses which were part of the church. An altar and paintings can be seen within the apses. This is the best-preserved of the four temples, probably because of the church which saved it from destruction. 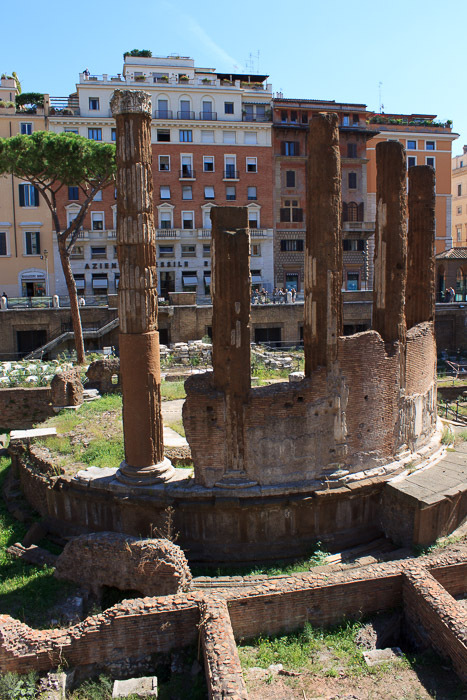 If you're interested in Juturna, read about the Temple of Castor and Pollux and the Lacus Juturnae in the Roman Forum. Temple B (1st photo below) is the most picturesque, being a round temple with 6 of its pillars standing on its raised base. 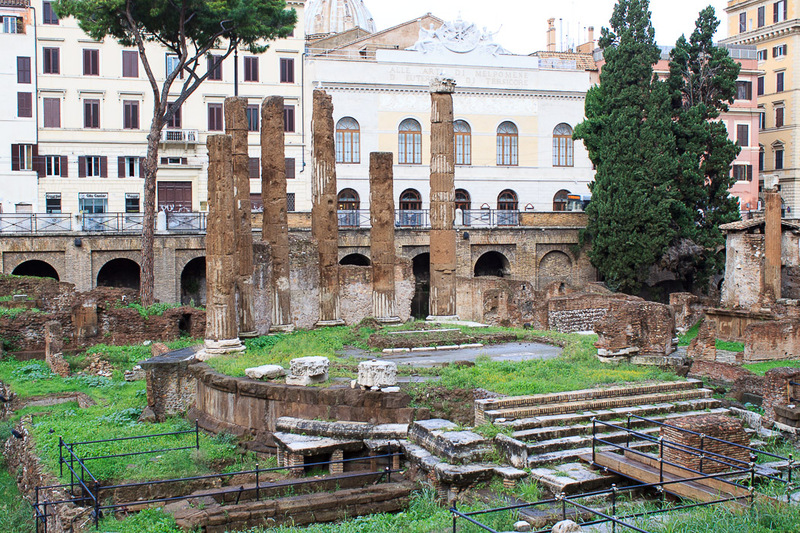 It is also the youngest of the four temples in Largo di Torre Argentina. It was vowed by Quintus Lutatius Catulus at the battle of Vercellae on July 30, 101 BC and was devoted to Fortuna Huiusce Diei, "the Fortune of This Day". Originally it had 18 Corinthian columns with tufa shafts and travertine bases and capitals, covered in white stucco to make them appear as marble. They were free-standing outside a small cella. Around 50 BC the small cella was demolished and the gaps between the columns were filled-in with slabs of tufa, enlarging the interior of the temple. Several antique Greek statues stood in front of the porch in the 70s AD. After the fire in 80 AD the walls were bricked-over, hiding the columns completely. In the early 1900's, Largo di Torre Argentina was a paved streetcar hub but was slated for reconstruction. 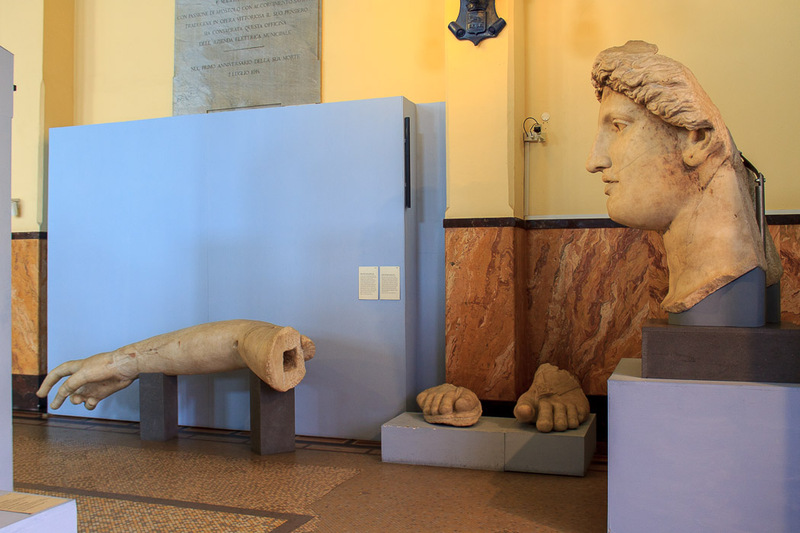 During the demolition work, the head and arms of a colossal marble statue were discovered. This led to the discover of the temples, denoted as the Area Sacra, "holy area", and the archaeological excavation was performed. The colossal statue, made by Skopas Minor in 100 BC, now in the Central Montemartini Museum, was the statue of the goddess which stood in this temple, starting with the temple's original version (3nd photo below, notice the eye-level museum signs behind the arm for scale). Temple C (at center of the photo below) was dedicated to Ferona, the goddess of fertility, and dates to the 4th or 3rd century BC. By looking at the temple today, you can see it was rectangular, but that's about all the detail I could make out. The temple as it appears today is from the period after the fire of 80 AD. The colossal head of a matronly-looking goddess, possibly from its cult statue, was found nearby. Temple D (at left edge of photo below) is the largest of the four temples but most of it is under the streets Via Florida and Via di Largo Argentina. Only a small corner is excavated and exposed. There is not much of this temple to see at all. It was dedicated to Lares Permarini, protector of seafarers, and dates to 2nd century BC. This identification might be wrong, though. Other temples which were in this area but have not been identified with any ruins were dedicated to Juno Curitis (Juno as a protectress of spearmen), Jupiter Fulgur (Lightning), and the Nymphs. The Temple of the Nymphs has been tentatively associated with the TempleOnTheViaDelleBottegheOscure, and the temples of Juno Curitis and Jupiter Fulgur were probably next to each other, so unless there is another temple south of Temple D, or the identification of the Temple of the Nymphs is wrong, Temple D is likely the Temple of Lares Parmarini. Largo di Torre Argentina is one of the places in Rome that most obviously shows how much lower ground level was in the distant past than it is today. When you look into the excavated temples from today's ground level, you're looking down into a pit about 12 or 15 feet down. 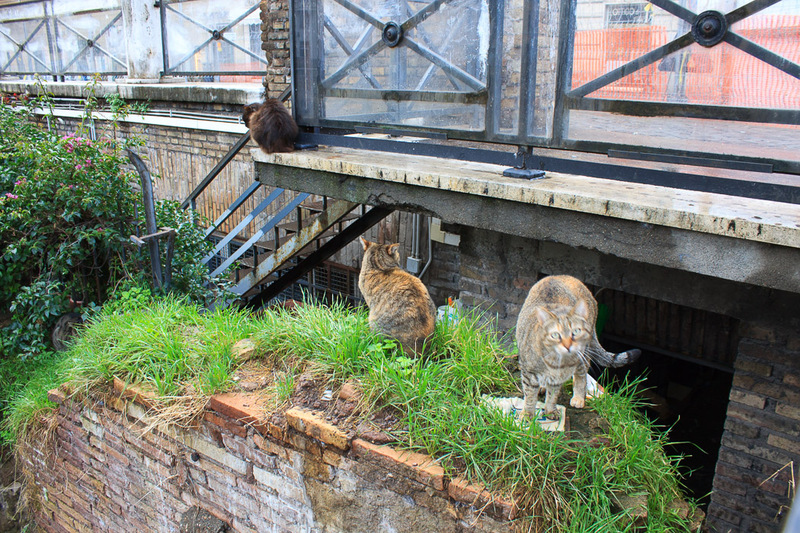 Largo di Torre Argentina is a haven for stray cats, and I saw a lot of them during my visits in late 2012 and 2013 (1st photo below). Largo di Torre Argentina is named for Torre (tower) Argentina, which once existed about a block west of the square, attached to Casa del Burcardo, at Via del Sudario 44, but has since been torn down. The name of the tower, and therefore the name of Largo di Torre Argentina, comes not from the South American country, but instead from Argentoratum, the name of the diocese of the 15th century German bishop who owned the house and tower. 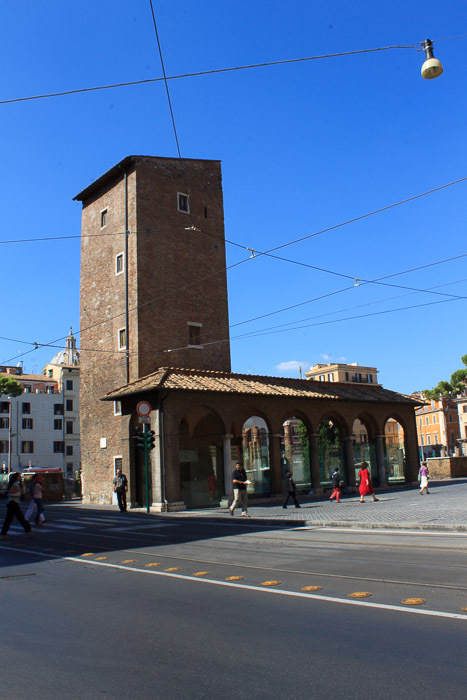 In the southeast corner of the square is the Medieval Little Pope's Tower (Torre del Papito) (2nd photo below), which most people incorrectly assume is the tower that the square has been named after. Largo di Torre Argentina has some interesting historical photos.